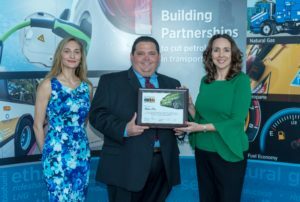 During an awards ceremony in July, New Orleans Division Manager Jesse Murphy received a certificate honoring Waste Pro as a 2017 Clean Fleet Leader. In 2011, Waste Pro invested $100 million in Compressed Natural Gas (CNG) powered collection and recycling trucks, which provide an environmentally-friendly alternative to diesel fuel by reducing emissions to improve air quality. Since then, Waste Pro has opened seven CNG fueling stations and added more than 300 CNG trucks to its fleet.